Well, its about time I revived this blog and what better way than to talk about a book I have just finished reading for the 2nd time. 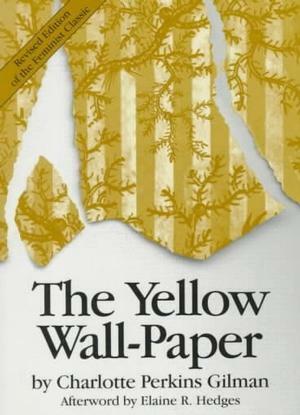 "The Yellow Wallpaper" by the American writer Charlotte Perkins Gilman [it is is all of 27pages and was first published in January 1892 in The New England Magazine.. The book is entirely in a first person narrative.. It is all about what One woman goes through, dealing with her husband [a physician], brother [also a Doctor], husband's sister and a housekeeper, not to mention her own thoughts which daunt her day and night. All this happens at a home away from home, a place chosen to help her recuperate and cure herself of what she deems to be “nervous depression" but one that is completely shrugged off by her husband and others, sometimes they even mock her. Over time she starts exhibiting different behaviour in front of those who don't accept she has a problem and on her own she is a completely different person. She wants to occupy the rom downstairs that opens out to a garden with flowers, but her husband decides otherwise and they move to what used to be the nursery upstairs. He says the room downstairs is small and even if he wants a room of his own, there are no others nearby. Yes, it is a big room, but quite drab. She hates the wallpaper and wants to rip it off. She is left with nothing to do and no one for company, she stays confined to the room upstairs and does nothing but is lost in her thoughts or writes in her journal. Unfortunately her husband or his sister do not approve of her writing and so she hides it from them. She slowly she starts developing an increased interest regarding the room’s wallpaper, especially the pattern. Over time, with nothing to do, the wallpaper becomes her sole focus and soon her interaction with it grow deep and dark.. The book speaks volumes about how women/people are just ignored when they talk about having random thoughts, fears or issues. They are told to just put those thoughts away, and focus on other aspects of life. Apparently, back in the 19th Century, women were considered psychologically quite frail and no attention was paid to their aspirations or desires. There is this one statement the woman makes in the book- "There are things in that paper that nobody knows but me, or ever will.” ... this left me haunted... I couldn't even wrap my head around what she was going through. Free download of the book is available on the net..
A piece in The Guardian about the book & the author..